Gardens thrive in nutrient-rich soil, and this is one of the reasons that fertilizers are so useful. However, fertilizer also contains many harmful chemicals and additives, is expensive and must be applied carefully at specific times of the year. Vermiculture eliminates all of this by allowing worms to naturally till the soil and release nutrients in the ground that our plants need in order to thrive. It is a well-known fact that gardens that have a lot of worms perform better than ones without them. Consequently, using worms appropriately can dynamically enhance crop productivity, control insects and recycle deposits that would otherwise neutralize the quality of the soil. Worms feed off of organic compost and leave deposits from their waste that help to break down the material faster than if it was left to decompose naturally. They also boost the nutrient level of the compost by adding numerous ingredients that enhance the quality of the material once it has broken down as well. Compost that has been enhanced by worms will produce some of the best soil that you can add to your garden. While the process of decomposition takes time, incorporating worms into the mix will speed up the process slightly while producing a much better finished product. Worms thrive in soil that extends about 18 inches below the surface. They also multiply rapidly, and populations can double every three months. This can be a good or bad thing. On one hand, you need worms in order to supply you with a nutrient-rich garden and promote the composting process. On the other hand, it’s important to keep populations under control and evenly distributed in order to ensure that they have plenty of room to breathe. Consequently, it’s important to think ahead when starting a worm harvesting system. A good rule of thumb is that you should have one pound of worms for every pound of compost. This will give the worm enough food while also preventing overcrowding. Additionally, worms should be harvested every three months or so in order to “thin out the herd” and allow them to add nutrients to other parts of your garden. The best thing to do is remove old worms after three months and place them in a new location. However, once they are established in your garden, you can simply leave them alone and let them do their job. All you really need to worry about with respect to worms is to provide them with a good living environment. This includes placing them in deep beds of soil, keeping the soil moist and giving them plenty of food. They love water, and it’s important that the soil or compost is saturated with water when growing and harvesting worms. However, once they get in your garden, they will do just fine with natural soil conditions as long as it is irrigated on a regular basis. Worms feed off of fruit, vegetable and bread kitchen scraps, which is why they are the perfect match for most compost piles. However, they don’t really like meat, and you should avoid placing meat or dairy products into your compost as it will simply rot and attract pests. Worms do not get placed directly into your compost pile. Rather, you will build a new compost heap atop worm bedding that is designed just for them. The first step is to take a lot of newspaper and cut them into individual 1-2 inch wide strips. Pack a garbage bag full of clippings and add water. A good rule of thumb is that you will need 3 pints of water for every pound of newspaper. Mix the paper with your hand to ensure that the pieces are saturated with the water. Close the bag and let it sit overnight. Take some of the paper out of the bag in the morning and place it in your bin. Add a handful of soil and mix. Repeat the process until all of the paper has been transferred into the bin. The next step is to add the worms. 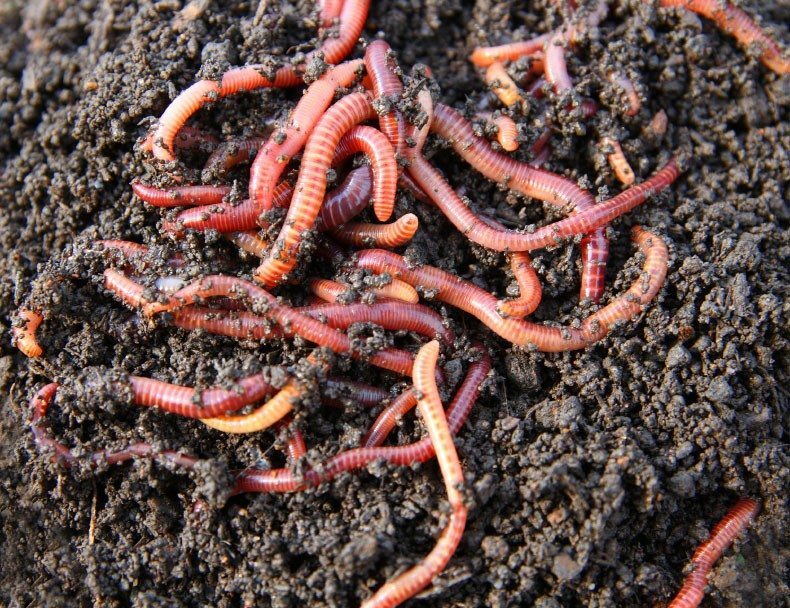 You want to use red worms as they are small and versatile enough to thrive in the bin you’ve created. Night crawlers will burrow into soil and not eat many organic material that you will be using for compost. Big earthworms need a lot of space to thrive and a worm bed is just too small. Place the worms atop the paper/soil mixture and watch them as they burrow their way down into the bin. All you need to do now is add some compost. A pound of earthworms can eat between ½ and 1 pound of food scraps per day. Feed them vegetable scraps and peelings, cornmeal, crushed eggshells, oatmeal and fruit rinds. They will also feed off of used coffee grounds or tea as well. Place the food scraps about between 2-4 inches below the top layer of material in the compost bin. You may also want to cut the scraps into smaller pieces as this will make it easier for the worms to eat and digest the material. You want to check the bedding about once a week to ensure that the worms like the food that you’re giving them. You will also want to ensure that the soil is not too moist or too dry. You want the bedding to have the consistency of a wet sponge. If the bedding is too wet, you can add more newspaper or food. If it is too dry, add more water. Also, check for any scraps that have not been eaten over the course of time. You will learn where to put the food to attract the most worms as well as what items they prefer to eat over others. After about six weeks, the bedding will become darker and shrink. This happens because the worms are not only eating the food, but the newspaper as well. You will also notice that fewer and fewer bits of food remain after about 2-3 months as well. It’s hard to say precisely when the best time is to harvest the worms. However, you want to wait until there is hardly any food left and the bedding takes on the consistency of a wet soil. This will generally happen after about three months, but it could be sooner if you are working with smaller bins with lots of food. The easiest way to remove the worms is to take handfuls of the castings (the black substance that resembles soil) and place them on a flat surface. Make numerous small piles and spread them out slightly. Shine a flashlight over the piles. Worms do not like light, and they will gravitate toward the bottom of the piles. Carefully remove the castings chunk by chunk until there is nothing left but worms. Now you can place them in your garden, yard, planters, sell them or use them for bait. You will learn more as you go than can be described here, and it’s really not that difficult to get a sense of what to do once you go through the process once or twice. You should consider creating numerous bins as you go so that you can place fresh worms in new compost piles and avoid overwhelming them with food. You should also gently till the compost and castings every couple of weeks to stir things up a bit and introduce oxygen into the material. As your populations of worms increases, consider digging a trench in the back yard and dumping your compost inside. Add the worms and watch how they can create a self-sustaining recycling system that can be incorporated into all of your gardening projects over the course of time. Vermiculture is one of the best ways to fertilize soil and promote healthy plant growth. Try this out for yourself and see how this can give better quality gardens that can lead to improved crop productivity while also creating a great way to process compost at the same time.